Leighton Wong, from the Naval Facilities Engineering Command -- Pacific, has been selected as the civilian engineer of the year. The honor makes Wong a nominee for the National Society of Professional Engineers Federal Engineer of the Year award. Selected as the military engineer of the year was Cmdr. David Smith, who served as a project engineer at Pearl Harbor. He is now with the Engineering Field Activity Southeast/Public Works Center at Jacksonville, Fla. In May 2005, Wong received environmental restoration awards from the chief of naval operations, secretary of the Navy, and secretary of defense. Senior Airmen Levina Sumang and Levana Raum, twin sisters who are members of the Hawaii Air National Guard's 154th Wing, are serving together in southwest Asia with the 379th Expeditionary Security Forces Squadron. During the first part of their six-month tour, Sumang, who is the older twin by one hour and 14 minutes, provided security on the flight line, according to an Air Force news release. Raum worked at a vehicle search pit. They are now both on flight line security. The Military Sealift Command will hold a job fair Feb. 1 at the Ohana East Hotel. Applicants must have a current U.S. Coast Guard Merchant Mariner's document with appropriate endorsements and documented sea experience. Job announcements with position-specific qualifications are available online at www.sealiftcommand.com/nowHiring.html. The World War II submarine Bowfin rested in dry dock in September 2004 for its first major makeover in 17 years. 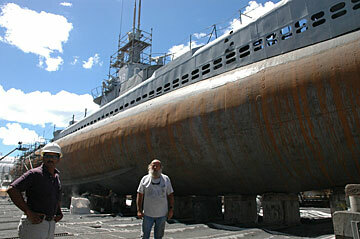 A documentary on the sub will be shown Jan. 19 at the USS Bowfin Museum. The History Channel's documentary on the career of the submarine USS Bowfin will be shown at 7 p.m. Jan. 19 at the Bowfin Museum, adjacent to the USS Arizona Memorial in Pearl Harbor. The film, which weaves the stories of Bowfin crewmen and uses battle footage with realistic re-enactments shot aboard the submarine, aired on the History Channel on Dec. 19. In the film Bowfin's veteran crew members relate the saga of SS-287 from launching to its permanent berth at Pearl Harbor. » Pearl Harbor: Cmdr. Thomas Zwolfer assumed command of the USS Bremerton, relieving Cmdr. Charles Logan.